BMW has teased the upcoming 2 Series Gran Coupé ahead of an official announcement, revealing a single teaser image of the upcoming liftback. The four-door coupé will have its world debut at the Los Angeles motor show in November before going on sale in early 2020. A concept version will be revealed at BMW's annual results press conference by CEO Harold Krüger. The 2 Series Gran Coupé was most recently pictured undergoing winter testing ahead of its planned reveal. 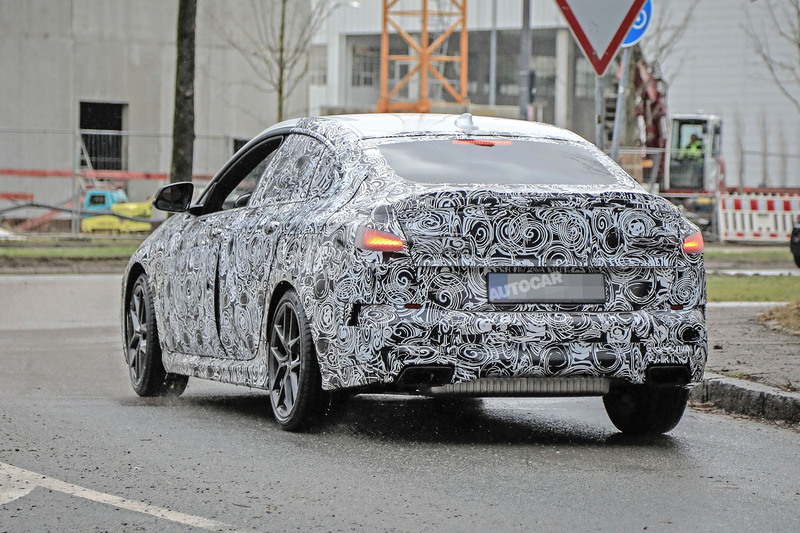 The four-door version of the 2 Series Coupé can be seen in our latest spy shots with camouflaged bodywork. Aside from revealing the shape of its body, with a raised rear roof section and rear doors, they also provide a closer look at the rear lip spoiler and larger brakes that will likely designate M Sport versions of the car. These photos closely match the previous spy images of the car seen testing in warmer climates, suggesting that development is reaching the final stages before launch. The need to accommodate two conventional front-hinged rear doors and sufficient rear seat leg room is said to be behind the decision to give the new car a wheelbase that's halfway between the 2690mm span of the 2 Series Coupé and the 2810mm of the 3 Series saloon. Inside, the 2 Series Gran Coupé will sport a new interior layout that's also set to be adopted by the successors to today’s 2 Series Coupé and 2 Series Convertible, which are due in 2020. The turbocharged three-cylinder and four-cylinder engines for the 2 Series Gran Coupé will mirror those of the existing pair. On the petrol side, expect a 134bhp 1.5-litre three-cylinder unit in the 218i, 181bhp and 242bhp 2.0-litre four-cylinder units in the 220i and 225i and a 326bhp 3.0-litre six-cylinder in the 235i. Among the diesels will be 148bhp, 187bhp and 221bhp 2.0-litre four-cylinder units in the 218d, 220d and 225d respectively. Like its two-door siblings, the 2 Series Gran Coupé will offer a choice of a standard six-speed manual or optional eight-speed torque-converter automatic gearbox, as well as optional xDrive four-wheel drive. However, the latter will be offered in combination with only a limited range of engines. The highlight of the new line-up, though, will be the M2 Gran Coupé. This model will use the same 365bhp turbocharged 3.0-litre in-line six-cylinder engine as its highly lauded two-door sibling. It will be offered with a standard six-speed manual or seven-speed dual-clutch automatic gearbox. Although it's still early days, the S55B30-designated engine is expected to provide the M2 Gran Coupé with similar performance to the M2, which has an official 0-62mph time of 4.4sec in manual form and an electronically limited top speed of 155mph. The 2 Series Gran Coupé will be produced alongside the 2 Series Coupé and 2 Series Convertible at BMW's plant in Leipzig, Germany. A plug-in hybrid model is also mooted. This is expected to use BMW’s turbocharged 1.5-litre three-cylinder petrol engine and an electric motor mounted within the forward section of a standard eight-speed automatic gearbox. In combination with a lithium ion battery pack positioned within the floor of the boot, this is intended to provide the 225e with an electric-only driving range of up to 31 miles. A traditional saloon, has a boot/trunk, have things changed and if so, what is the correct term for a car with this attribute?. All GC cars have hatchback/5th door openings...so far. "Until recently, senior BMW officials were undecided whether to follow the direction already taken with the 4 Series and 6 Series GranCoupés (a traditional four-door design) or to favour a more radical five-door liftback proposal for the 2 Series GranCoupé." The 4-Series GC is a hatchback, not a 4dr. Dont confuse the GT with the GC. The GT is a 5 door hatch back. The GC is the 4 door version of the 2 door which is a 2 door version of the 4 door 3 series. Clear as mud. Nope. 6 GC is four door sedan. Both 3 GT and 4 GC are liftbacks. Just google "bmw 4 gc boot". The 4 Series Gran Coupe, unlike the bigger 6, has a liftgate instead of a decklid (which essentially makes it a low-roof version of the 3 Series Gran Turismo). It's still not a coupé. Yes it is, and they're entitled to say so..
Coupé simply means 'cut'. No-one ever said anything about the -number of doors. It's a cut-down version of an existing car for a less utilitarian look. In the modern vein, BMW have chosen to cut some height from the roof-line instead of length from the wheelbase. See the Rover P5 coupé from the '60s for details.